We have received a few recent requests for attaching an tablet or smartphone to a tripod. 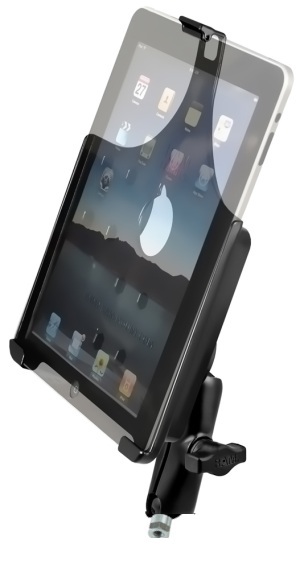 In the case of an iPad user, they wanted to watch movies on their device and wished to use their camera tripod as the mounting base. Clever idea but he had no way of attaching the tablet to the tripod. In the case of an iPhone customer, she wanted to take better pictures with her iPhone and wanted to attach it to her iPhone. She was looking to stabilize the resulting image. We also had a customer that wanted to use a tripod as a stand for their music scrolled out on a Motorola Xoom. For those that wish to use an existing tripod or monopod, we present a selection of options. These mounts all have a common 1/4″ – 20 female base to screw onto your tripod or monopod. Some have custom cradles. During the second half of 2011, Garmin released a new generation of their 10-year old eTrex GPS line. Options range form a basic black and white display on the eTrex 10 all the way to a color screen with nice additions like a compass and built-in barometric altimeter with wireless route sharing on the eTrex 30. These units are very competitively prices and are marketed to hikers, bikers and geocachers for handheld use. We all know that people will use these for more than simply handheld use, so without further ado, we present some innovative solutions.